WWE fans who were hoping for an impactful debut by Samoa Joe at the Royal Rumble may have been disappointed, but they got their reprieve last night as Joe did indeed make his main roster debut on RAW and did so in a big way. For all the fans that hoped Joe would come out at number 30 in the Rumble and then were completely deflated when number 30 turned out to be Roman Reigns, keep in mind that Joe probably wouldn’t have gone on to win the Rumble, and thus his debut would have had much less impact than the way he debuted on RAW. Since NXT Takeover: San Antonio, WWE has pushed the Triple H vs. Seth Rollins feud into high gear as Rollins showed up and called out Triple H in a company where H is just known as the guy that runs the show backstage; this was a nice change of pace and brought a realistic “invasion” vibe since NXT rarely crosses over with other WWE programming. 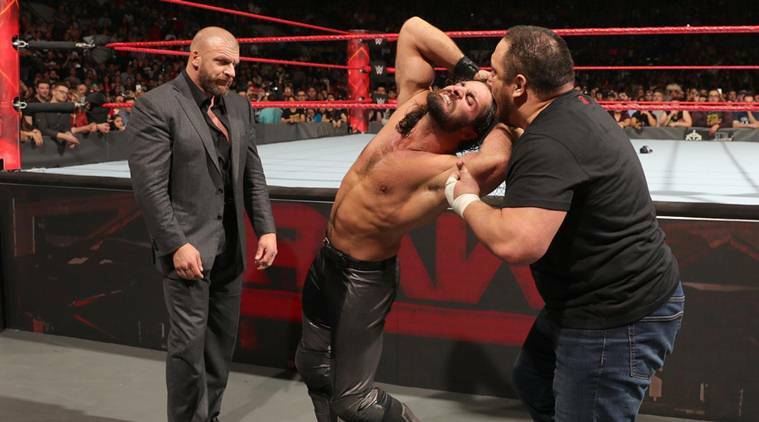 While Triple H and Rollins didn’t have much interaction at NXT, the big story on RAW was that H was on his way to the building and would have a confrontation to end the show. Triple H came out to a big reaction as he’s been pretty much off TV since last year’s WrestleMania, which has been a smart move if they wanted to really fuel his feud with Rollins. Triple H cut a classic heated promo on Rollins, pointing out that he handed him everything and made valid points about the timeline of Rollins’ career in WWE. Just as Triple H called out Rollins and it looked like we would see the first physical confrontation to set up their WrestleMania 33 match, Samoa Joe intercepted Rollins and was immediately put him in a main event position in his debut. When Samoa Joe arrived in NXT, it seemed as if the company was bringing in some veteran talent to help build their younger talents who could benefit from working with a veteran like Joe; then it quickly became apparent that Joe’s talents couldn’t be denied as he ended the historic NXT Championship reign of Finn Balor, and has since traded the title with current champion Shinsuke Nakamura. Soon the talk was that Joe should definitely be on the main roster, and now that has become a reality. Samoa Joe vs. Seth Rollins is a fresh match that should generate interest and will undoubtedly be great in the ring as well; I look for the match to happen at the Fastlane PPV and will likely further the Triple H vs. Seth Rollins story leading into WrestleMania. The big question now is, will WWE keep Samoa Joe in a spotlight position? We wrote years ago that Samoa Joe lost something in TNA, but admittedly WWE has done a great job of keeping Joe’s character in tact in NXT, and now he has a whole new world of matches and feuds to be involved in on the main roster. Money In the Bank Ladder Match Turning into Heavyweight Battle?